We have the tools to fight climate crisis. © 2019 We Don't Have Time – All rights reserved. 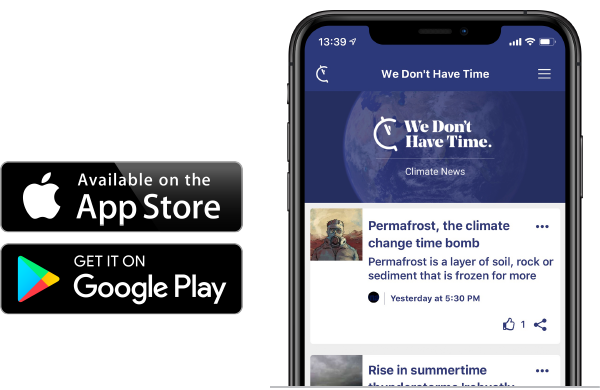 We Don’t Have Time is a social media network for everyone who wants to be a part of the solution to the climate crisis. If a large enough number of people want change, and if that energy is directed towards those in charge – change comes. But we don’t have time to wait. The social network is operated by the company WeDontHaveTime AB (publ), whose majority shareholder is the WeDontHaveTime Foundation. The Foundation’s principal purpose is to contribute to a reduced climate impact and an ecologically sustainable environment. Our headquarters is located in Stockholm, Sweden.